The hottest news over the long Labour Day weekend seemed to be the opening of the famous Hokkaido Bake Cheese Tart at Ion Orchard! 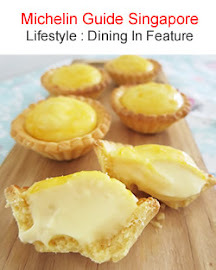 The fuss and buzz over these popular cheese custard tarts filled the social media and news, with people reportedly queuing 2-3hrs to buy some! I'm certainly a big fan of the Bake Cheese Tart, having tried it in Tokyo last September (queued 30mins for it). It was so good, with crunchy tart pastry and creamy gooey cheese custard filling. Missed it very much and after coming back, had experimented and successfully baked the tarts which I say probably about 60-70% close to original. 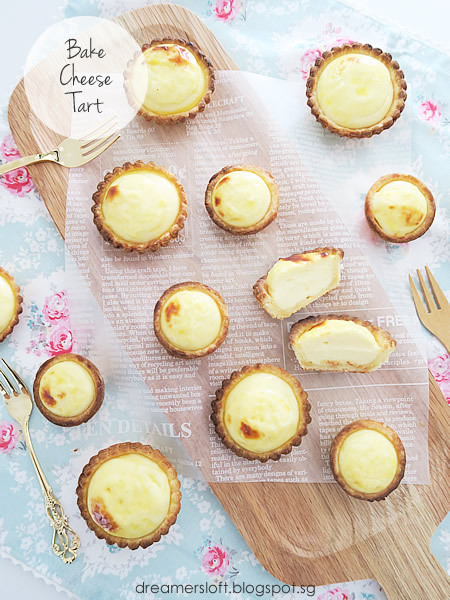 My first post on the cheese tart is apparently quite popular and I realised it comes out top 5 in search engines when I search for "bake cheese tart recipe". Woohoo! Now, over the weekend, all the buzz made me crave for some tarts but I certainly ain't going to queue for them at this point (no time! ), so decided to make another batch on Sunday. Will wait till the craze period is over, then go buy some (must support Japan, my favourite country). So, gonna share two more recipes in this blog post; they are variations from the first. No detail step-by-step photos, just a few WIP photos. Please refer to my first post for details. Using the same recipe as base, I made some minor adjustments to the tart pastry and cheese custard filling. Because previous recipe, the tart pastry quantity wasn't enough for all the cheese custard filling, and also this time I ran out of certain ingredients. - Ran out of icing sugar, so replace with caster sugar. - Not enough parmesan cheese powder, top up with more mascarpone cheese and butter. Instead of baking all of them in uniform size, made a few of them petite size. 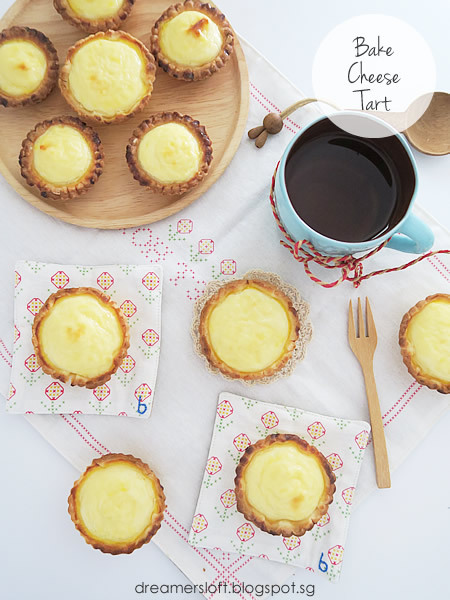 Super love the petite ones as I can eat them in one or two bites, or simply pop the whole tart in the mouth and get high on creamy gooey cheese custard! 3 sizes here. Using 7cm fluted cutter/4cm base tart case, 6cm fluted cutter/3.5cm base tart case, 5cm round cutter/2cm base tart case. The cheese custard should be of "pipe-able" consistency (was just a tad over-cooked this time, should be slightly more flowy). And didn't watch the tarts in oven closely last 2 mins, some tops were slightly burnt. Start with tart pastry. Sift cake flour and icing sugar into a large bowl. Add cold salted butter cubes. Using finger tips, break the butter and rub the butter into the flour mixture, until it resembles bread crumbs. Add egg yolk to the mixture, use a scrapper to mix the egg yolk into flour mixture. The mixture will come together and thereafter, use hands to form the mixture into a dough. Add fresh milk, the dough will become very soft and pliable. Knead the dough gently into a ball. Place on a piece of clingwrap. Wrap the dough and place in fridge to rest for about 1 hour. While waiting, prepare the cheese custard. Add cream cheese, mascarpone cheese, fresh milk, caster sugar and salted butter into a small pot. Place the pot into a large, shallow pan/pot with barely simmering water. This is the bain marie method, to create a gentle and uniform heat for cooking custard. Keep stirring the mixture till everything is melted. Once the mixture has melted, add sifted corn starch. Mix till well-blended, the mixture will thicken slowly. Add full egg, vanilla extract and lemon juice. Mix till well-blended, the mixture will further thicken into custard. Taste the custard and if desired, add some sea salt to increase intensity of cheese taste. There may be some fine lumps and grainy bits in the custard, sifting will yield a more velvety smooth custard. This is optional. Let the custard cool down completely. Back to the tart pastry. Remove the dough from fridge. Dust a baking mat (and rolling pin) with flour, roll the dough thinly, about 3-4 mm thickness. Use the various size cutters to stamp the dough. Use a metal scrapper (dust with flour) to lift up the cut dough. Place the cut dough over the various size tart case and gently press it downwards. Using finger tips, gently press and mold the dough into the tart tin. 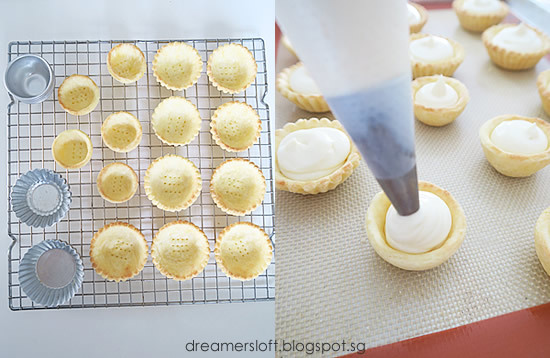 Use a fork to poke holes at the base of the tart cases. Bake the tarts at 180C, fan mode for 10mins. Remove from oven and place on wire rack to cool. 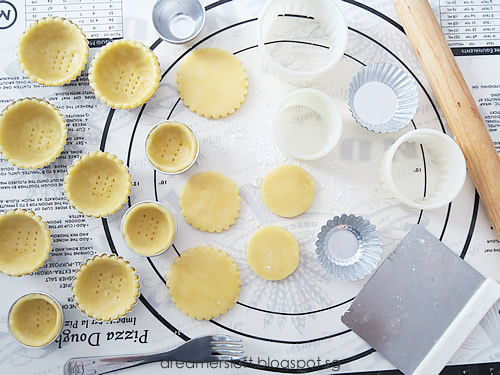 After the tart cases are cooled slightly, remove them from the tins and let cool completely before use. Preheat oven to 230C fan mode. Fill the cheese custard into a piping bag. Pipe the custard into the tart cases, shape slightly domed. Brush custard evenly with egg yolk. Bake the tarts at 230C fan mode, for 6-7 mins. Once baked, remove from oven and place on wire rack to cool. Best eaten warm, freshly baked. The tart pastry that I used seems to be on the softer side, more delicate texture. While it's crispy fresh from the oven, it turned soft after half a day (pop into oven for a few mins and it'll turn slightly crispy again). 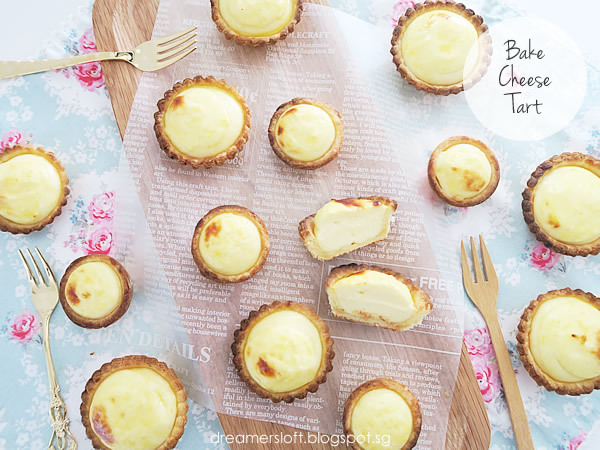 The real Hokkaido Bake Cheese Tart actually yields a slightly more crunchy tart pastry, so this time I decided to change to another recipe, a Sweet Tart Pastry which I used for my Yuzu Curd Tart. - Use an assortment of cheeses, 2 types of cream cheese, cheddar slice, parmesan slice. 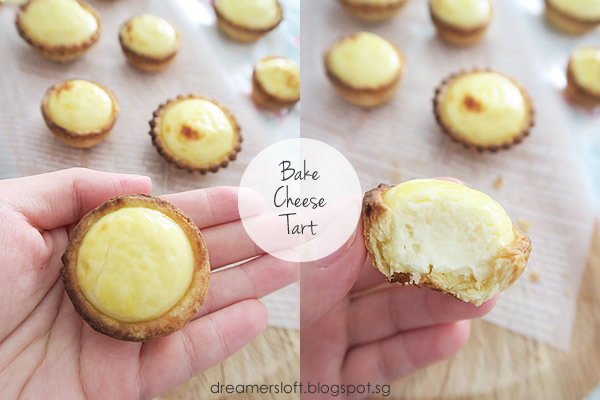 - Instead of fan mode, bake the cheese tart using top and bottom heat, and for longer time. 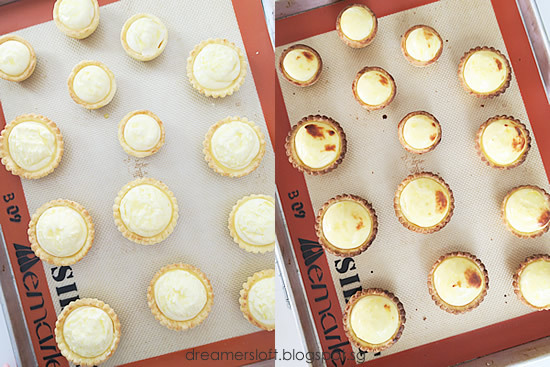 Love how this batch of Bake Cheese Tart turns out! 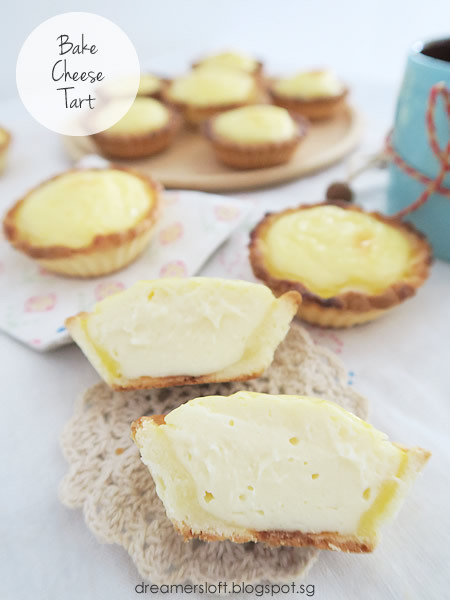 The tart pastry is certainly more crunchy, and the cheese combination is more full-bodied, tasted great!! The custard is still slightly overcooked; although custard is creamy and gooey, prefer it to be a tad more flowy. Oh well, it's really trial and error. All the dairy products I used for this batch, Hokkaido fresh milk, Philadelphia cream cheese, kiri cream cheese, Hokkaido cheddar slice and parmesan slice (bought them from Taiwan last Dec and totally forgot about them, about to expire!!) and President salted butter. I must share about this Sweet Tart Pastry! It is a nightmare to work with because of higher butter and icing sugar content. The only way I could do, was to work fast and dust constantly, in fact, every roll I dust, flip over also dust. Just keep dusting otherwise it's so sticky and soft that it's impossible to stamp and mold. Also, the pastry will expand a little when baking, I forgot to put baking weights for the first 5 tarts :( And because the dough was so difficult to manage, I had a hard time shaping and also didn't place the pie weights more carefully, the tarts turned out a bit ugly, more rustic-looking. I do like this tart pastry as it's more crunchy. Will search for a more manageable pastry, or handle the dough more carefully next time. To test the difference in oven modes, baked the cheese tart at 230C using top/bottom heat (instead of fan mode) for 10-12 mins (instead of 6-7 mins). The tarts looked perfect at the 11th min, but I delayed till 12 mins (don't ask, was distracted by something), and some parts got too browned -_- So once again it's a must to watch the tarts closely towards last few mins!! Add egg to the mixture, use a scrapper to mix the egg into flour mixture, until a wet dough is formed. The dough is super soft and sticky. Use a scrapper to scrap the dough on a piece of clingwrap. While waiting, prepare the cheese custard. Add all the cheeses, fresh milk and salted butter into a small pot. Place the pot into a large, shallow pan/pot with barely simmering water. This is the bain marie method, to create a gentle and uniform heat for cooking custard. Keep stirring the mixture till everything is melted. Once the mixture has melted, add sifted corn starch and icing sugar. Mix till well-blended, the mixture will thicken slowly. Add full egg, vanilla extract and lemon juice. Mix till well-blended, the mixture will further thicken into custard. Taste the custard and if desired, add some sea salt to increase intensity of cheese taste (I didn't add this time). Back to the tart pastry. Remove the dough from fridge. Dust a baking mat (and rolling pin) with flour, roll the dough thinly, about 3-4 mm thickness. Use 7cm fluted cutter to stamp the dough. Place the cut dough over a 4cm base tart case and gently press it downwards. Using finger tips, gently press and mold the dough into the tart tin. Use a fork to poke holes at the base of the tart cases. Place a piece of baking paper over the dough and place pie weights into the dough/tart case. Preheat oven to 230C top/bottom heating mode. Fill the cheese custard into a piping bag. Pipe the custard into the tart cases, shape slightly domed. Brush custard evenly with egg yolk & fresh milk mixture. Bake the tarts at 230C top/bottom mode, for 10-12 mins. Watch the tarts carefully towards last 2 mins. 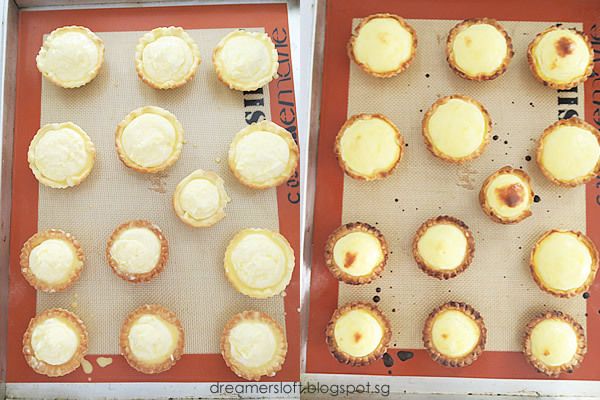 The original Bake Cheese Tart cheese filling is really sharp and cheesy, so I would say the V2 filling is closer. In terms of texture, I over-cooked the V2 filling slightly, my first recipe texture is more accurate. But then again, I've seen some folks post pictures of the ones they bought in SG, its texture is closer to the V2. The ones I ate in Tokyo, the texture is closer to my first version. For a start, you can use the first tart pastry with V2 filling. Only after you are confident, then try the V2 pastry. You can use Kraft. Or get the President brand or other brands with different types of flavour, mix and match. What do you mean by 26g whole egg - a whole egg without the shell? 1 egg yolk + milk mixture for brushing on top of custard - what is this milk mixture? Do you grease and flour the tart tins first? Can you pre-make the cheese custard and refrigerate overnight or two days before baking? 1) Yes, it's weight of the egg without shell. Typically a large size egg is about 52-54g without shell. So it's about half an egg. If you don't wish to waste half an egg, you can make double portion (as the dough can be freeze for later use). Or you can save the half egg to mix with milk for brushing on top of custard. 2) What I meant is egg yolk and milk mix together to get mixture. 3) Not necessary to grease and flour the tart tins because the pastry is butter-based so will come out from tin easily after baking. 4) Can try to pre-make the custard the night before, but the consistency/texture of the custard might change after chilling -> become dryer. Probably you have to cook the custard till just before the gooey consistency (i.e. a bit runny stage). As for 2 days before, I'm not so sure because it's cheese after all, not so lasting. 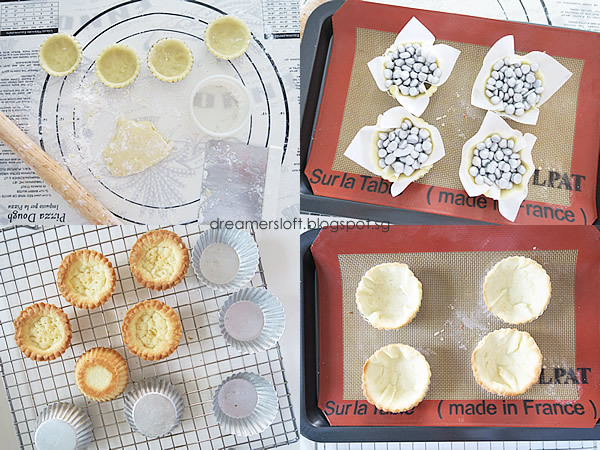 5) For the pastry, you can either blind bake first or chill/freeze the tart dough till ready to use. Just note that tart is likely to turn soft (even though store in airtight container) due to our high humidity, try not to keep too long. 1. Over baked the tarts slightly (my oven is probably hotter than yours at the stated temperature)! 2. I overcooked the cheese custard so it was a bit too stiff to pipe into a dome shape (looked more like swirls) - how did you pipe yours to get such a nicely round shape? But strangely, after baking, the texture of it was quite yummy and oozy! 3. 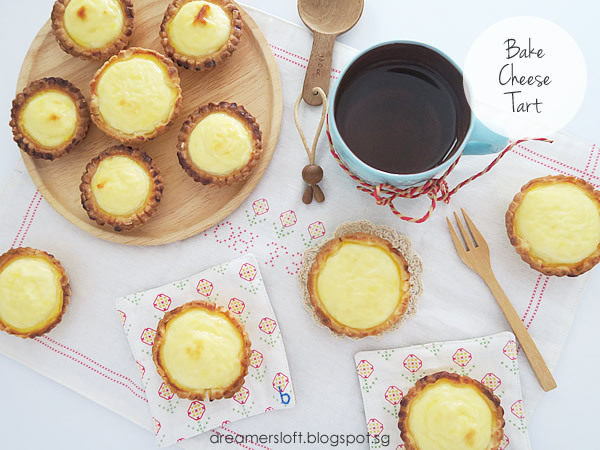 For this V2 recipe, did you mix egg yolk with some milk before brushing the tops of the cheese custard? If so, how much? 4. I could not seem to find the Meiji cheeses you bought in Taiwan, even at Takashimaya (I haven't tried Meidi-ya though). 5. At what temperature and for how long did you reheat leftover tarts till it was at its best texture? Thanks again for the recipe - it was fun to do and delicious to eat! 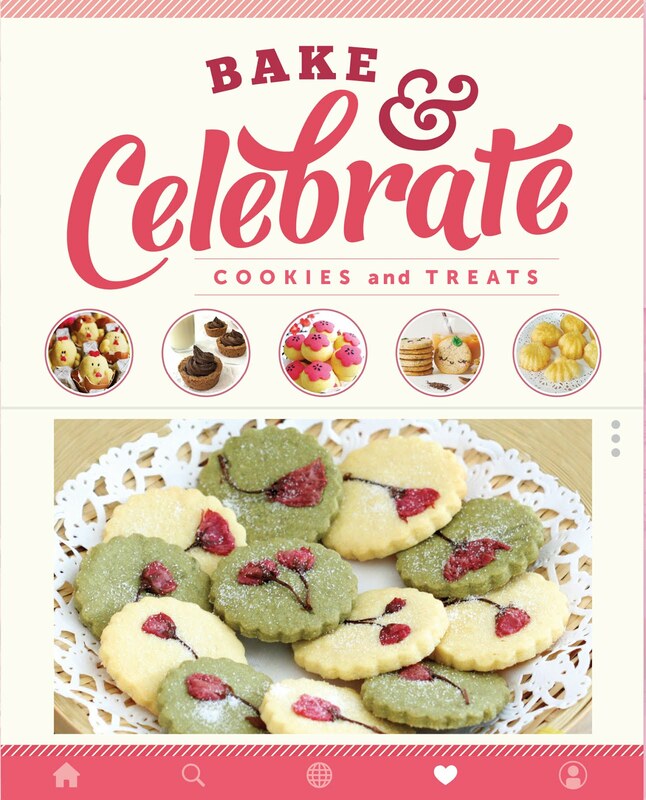 Thank for being so generous in sharing your recipe. I will be trying it tomorrow. If I may offer a suggestion? For the sweet dough, if you use all purpose flour (10 or 11% protein) instead of cake flour (7 or 8% protein), the dough will be stronger and easier to handle when lining your tart moulds. 1. Yep, oven temperature varies so it's best to monitor closely and test it out. 3. Yes, I mixed egg yolk with milk, but didn't measure how much, just agar agar such that the mixture is not too watery. 4. 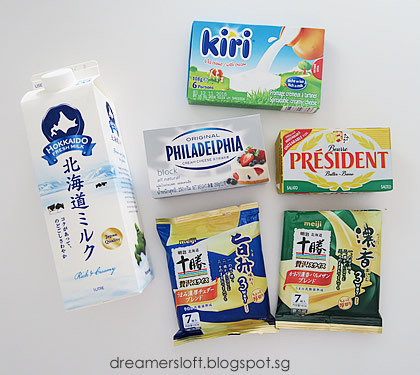 Don't think can find the Meiji cheeses here in SG. If you go to Meidiya or Isetan, can try out the various Japanese brands available. 5. I actually used my air fryer to heat up the tarts :p About 130-150 degree celsius for 5-10 mins (depends whether they are taken right out from fridge or at room temperature). Once again, agar agar, just keep checking to make sure they weren't burnt. Hello, thank you for this recipe. 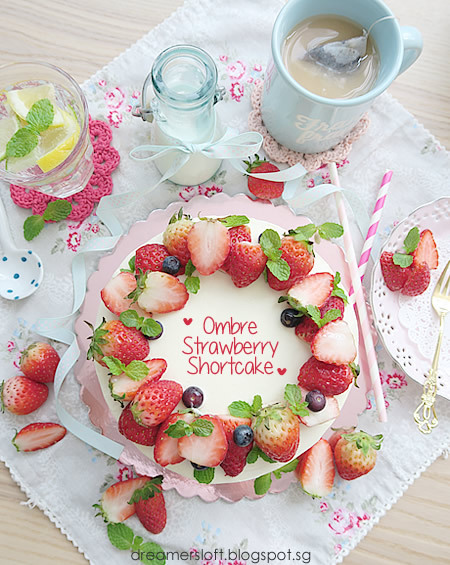 I tried BAKE in Japan and have been craving for it since. Can't wait to try this!! For the cheese custard, do you think it would make a difference in the consistency (fluffier?) if you fold the egg whites after you cook it? Do you mean making a separate egg white meringue, then fold into the cheese custard? Interesting, I've not tried it before, probably you can try and let me know how it goes? Since I don't have a fan oven, do you have an idea of the temperature difference in a convection oven? Thank you for sharing all your tips. I tried these in Bangkok and I have literally had dreams about them so I am so looking forward to experiment and hopefully get close to that delicious taste. Try increasing the temperature by 5-10 degree celsius. I have tried 230-235 degree celsius top and bottom heat (conventional mode), it works as well. But monitor the timing, may need to reduce, I tried about 6-7 mins if don't want any burnt marks on the custard. Hi Daydreamer, I found a table conversion https://www.bbcgoodfood.com/conversion-guides, but I went with the "electric" option, somehow that worked (closely monitored). I made the tarts on Sunday and the only thing I had a hard time with was the dough, I just couldn't roll it out for some reason, I had to use a lot of flour and a plastic sheet so it wouldn't fall apart, but once I baked it and followed your recipe (everything but the kiri cheese) they came out perfect, I took out some of them at the 10 minute mark, left some a while longer and oh my God, even my husband was impressed since we both loved these delicious tarts when we first tried them.